Q1) When did you start racing and what was the first track you ever saw or raced? A) I started racing in 1980 when I was 10 years old. My first track was the Peru Indiana fair grounds and it was my first race. Q2) When did you get a Powerlite ride? Was it factory or co factory? Was it thru a bike shop if so, which one? A) In 1981 I got a Powerlite bike for Christmas. My dad and I worked hard to get it ready for the World Championships in Indianapolis that were held in January. I made the main and was the only “non” factory rider on the gate. I won the main and instantly fell in love with my Powerlite. We called Steve Rink and told them of our success and I rode for Powerlite Factory team for the rest of my racing career. Q3) How long did you ride for them? 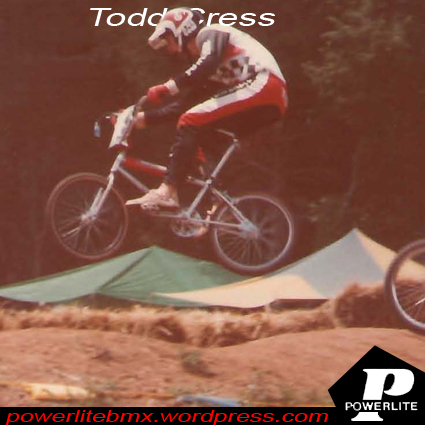 A) I rode for Powerlite from 1981 to 1985 when I gave up the sport. Q4) How long did you race till? A) I quit in 1985 (16 years old) as I was a Sophomore in High School and I did not have any local friends that still raced. It was a tough call as I still loved the sport, but other sports were of interest and racing in the Midwest at that time was not as popular as it was when I was little. Q5) What sanctions did you ride mostly? A) I mainly raced NBL, but occasionally did some ABA races. Q6) Who was your main competition? 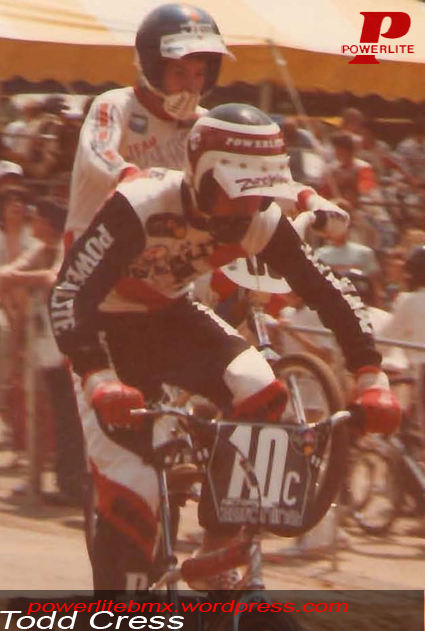 A) My main competition were other factory riders…Doug Davis, Billy Griggs, Steve Veltman, Mike King. There were a lot more, but it’s been a long time and those were the guys that I remember the most. Q7) Got any cool BMX stories you can share? A) I have so many great memories of being at the races. My stories are all pretty tame as I raced from 11 years old to 16 years old. My best memories are all of the traveling and hanging out with the other riders and teammates. 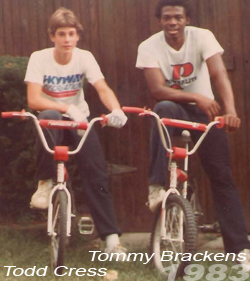 One Summer Tommy Brackens stayed with me and my family for a week and we went to a couple of Nationals together in the Midwest. He was not only a fast rider, but a great guy and I enjoyed training and traveling with him. Q8) Got any of your old bikes or gear? A) Unfortunately I do not have any of my old bikes. I do have a few of my old jerseys and number plates that my mom saved for me. Q9) What’s your favorite restaurant chain, fast food or not. A) I live in Phoenix, Arizona now and I would have to say that I’m a huge Mexican food fan. There are some great Mexican food places, but as far as a chain I would have to say that Rubios is probably my favorite place. Q10) What’s your favorite racer of all time? A) Wow, I grew up watching some great Pros so that’s a tough one. I’m gonna go with Tommy Brackens for obvious reasons, but I would have to say that my favorite guy to watch was Richie Anderson. There was nobody smoother than that guy. None at this time if you had a ride thru a local bike shop let me know. Often factory’s would hook up local riders thru a bike shop. SE hooked up tons thru Pedaler’s East, as did DG. Langley’s also in Vineland, NJ hooked some up with Robinson. I swear I remember some Eastern PA or NJ riders hooked up thru a shop with Powerlite. If you know of any that are missing or details like the state they are from (or were) and the years they raced for Powerlite feel free to leave a comment. Thanks in advance for contributing. Mitch Tramm has uncovered a hidden treasure. 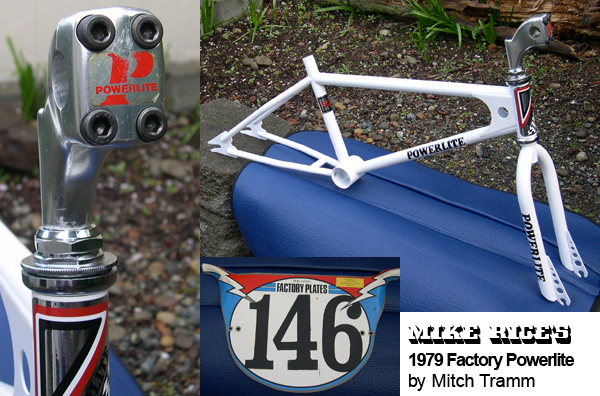 The actual 1979 race bike of Powerlite Factory Pro , Mike Rice! Mike hailed (may still) from Washington which had one of the early biggest and fastest Pro scenes. Only California and probably Texas, Florida and New Jersey had as many pros in 1979. Mitch has begun restoring Mike Rice’s bike. 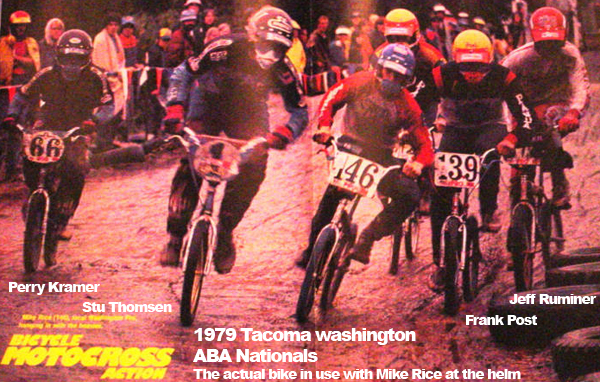 The bike and Mike were captured in a 2 page color photo spread by “Bicycle Motocross Action” (all pictures used courtesy Bob Osborn and can not be used or reproduced without his expressed written permission). Obviously at the 79 ABA Tacoma, Washington National Mike made a name for himself. He also must have gotten the hook up from Bob Haro as you can see he is running his ABA issued Pro Plate in the photo. But in the restoration his 79 Haro plate also survived all these years. Note the ultra rare Powerlite stem. This build is a special one for sure. Note that Powerlite may have made 3 size forks. Not sure if all three went into full production. I myself have never seen the “Pro” version of the forks. Forward loading axle slot and blogna cut (like SE) fork ends. Sweet. Are the JR smaller 20 inch or are they actually 16 inch forks? Anyone have the answers chime in please! 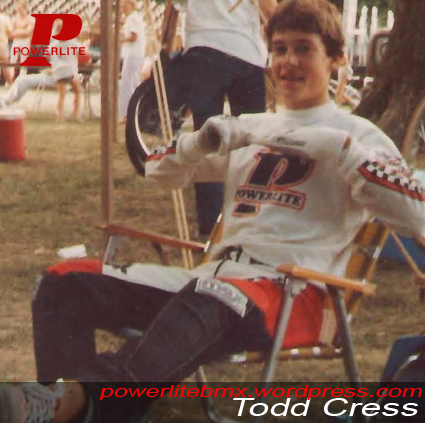 Lots of famous and talented riders raced the red, white and black of Powerlite. Perhaps none faster then “The Human Dragster” himself, Tommy Brackens. Hailing from Southern California, Tommy became famous riding for Jag. He also did stints with GT. He eventually started Brackens Racing and made some great bikes and sponsored some great riders like Eric Carter. Tommy also opened up his own sneaker store in Fullerton, CA selling “Awesome” shoes. Awesome was created after a split in the Van Doren family. Mark 4 was a line of soft goods by Powerlite. This ad shows the numberplates and the visors.